I liked your game, the graphics are great, then you can evaluate mine? Thank you! We just played yours. Nice job but I feel like some visual feedback that the enemies were taking damage would have been a big plus, because it's sometimes hard to tell. The colors you chose are all very complementary. I enjoyed wandering around. 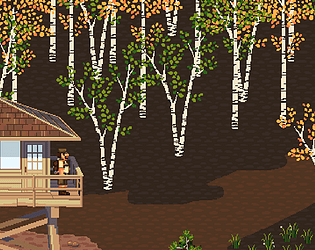 Amazing pixelart work here, really lovely stuff! Also great camera work when climbing the tower. This has a lot of great potential - hope you manage to finish this someday. Thank you so much for your kind words and support! The programmation was all Robin (TwelveOThirteen) and he was the one who came up with that neat idea for the camera. We're hoping to make it even smoother as we work on it, because it was kind of a last minute addition. I liked the trees, great pixel art!